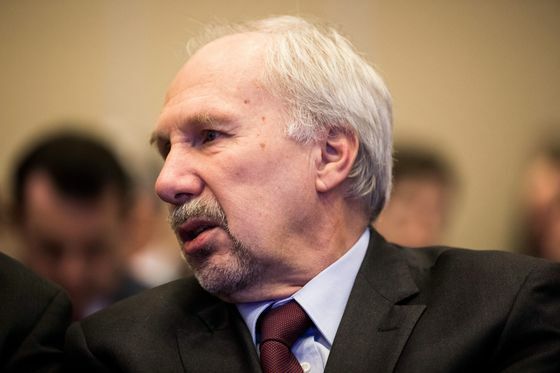 The European Central Bank is unlikely to significantly lower its growth forecasts in June as the euro-area economy should at least stabilize in the second half of the year, according to Governing Council member Ewald Nowotny. Discussions during the International Monetary Fund’s meeting last week left officials with a “slightly better outlook for China,” the Austrian central banker said in an interview in New York. Nowotny joins a number of policy makers including President Mario Draghi who in recent days expressed cautious optimism that the 19-nation economy will start to recover later this year, as the latest forecasts assume. Officials already pushed back interest-rate increases beyond this year and announced a new funding plan for banks that will become operational in September. Terms for the loans have yet to be agreed, and policy makers say the degree of generosity will hinge on economic prospects. Nowotny said the program should be designed to ensure that banks don’t end up getting permanently hooked on cheap money from the ECB. Instead, the focus should be on preparing banks for a gradual phase out of unprecedented stimulus. “Now, of course, in the economic situation we are in, we have to be very careful about normalization, but mustn’t lose sight of it,” according to the 74-year-old policy maker, who is due to retire at the end of August. For the moment, though, the ECB should stick to its wait-and-see approach, he said. While most of the negative risks officials flagged in the past have already materialized, an escalation of trade tensions between the U.S. and Europe could still damage the economy. As officials prepare to assess the state of the economy in June, Draghi has signaled they will also take a closer look at the impact of their negative interest-rate policy. His comments sparked speculation the ECB could follow its peers in Switzerland and Japan and exempt some excess bank reserves from charge. Since then, officials have expressed a lack of enthusiasm for any revamp and some doubt it will actually happen, according to people with knowledge of the matter. Nowotny said so-called tiering could make sense eventually if it’s targeted at alleviating the burden on banks and signals a beginning of policy normalization, but not if designed to keep interest rates low for longer. “There are measures aimed at simply providing relief for certain business models, for example the Swiss version -- that appears to me to be quite sensible, also in the euro area even though the time for that hasn’t yet arrived,” Nowotny said. The Swiss National Bank only charges banks for deposits exceeding a multiple of their minimum reserve requirements.